Nops Trials: A Novel – It’s Christmas day when we meet Lewis Burkholder, West Virginia livestock farmer and sheepdog trainer, and his talented young border collie Nop. The holiday is shattered when Nop is stolen. 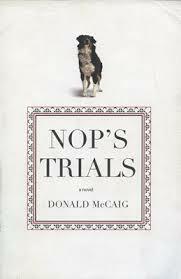 Nops Trials is the story of Nops fate, the abuse and brutality he suffers and his incredible resiliency. Its a story about a border collies undying desire to do his job and serve his master. It’s also about hope and desire and the depth of love and devotion that a dog and a human can feel toward each other.